Motherhood Statement by Karen Throssell was launched by Carmel Macdonald Grahame at the Warrandyte Cafe Melbourne on 11th April 2015. On earth in the light of the living. This collection of Karen’s poetry is the voice of one of those daughters, making herself heard, a knowing daughterly voice, the insider voice, retrospectively acknowledging and taking account of her mother’s life: ‘What a time to be living, writing and questioning…’’ (p.8), she says in one of many celebratory moments in these poems. The times in question are the context against which the personal significance of each poem rests, weightily. We are made aware as we read, of the political and intellectual background, the so-recent history, against which Dorothy Jordan lived her life as student, philosopher, activist, wife, and mother—in this country. It might seem odd to be quoting another poet in the context of launching Karen’s collection, but I do it to show what good company she is in with the publication of this work – Harwood being one of any Australian woman poet’s metaphorical mothers. Indeed, I had to resist coming armed with quotes from Motherlode, the 2009 anthology put out by Puncher and Wattmann. Or from Mother Love, Random House’s 1996 anthology in which Australian women’s stories about the complicated pleasures of motherhood are gathered. Or Kate Grenville’s current, One Life: My Mother’s Story, to name only some other works in which women writers address this great theme of mothers and daughters. So I quote Harwood to point to the enduring relevance of giving such careful attention to what has been described as ‘love as tentative as fingertips’ (MTC Cronin, in ‘My Mother, Her Mother, Her Daughter, My Daughter, Her Mother, My Mother, Her Daughter, My Daughter,’ with its implications about the female heritage motherhood is): ‘There is my mother./And there is me./We love like they do at borders./Together yet divided.’ This is the irrefutable, foundational stuff of the relationship, and into a wide-ranging cultural conversation about it, Karen places her thoughtful and affectionate anthology, Motherhood Statement. All the resonances of that title are at work in the poetry between the covers of what I’m sure you’ll agree is a beautiful volume. Sometimes this daughterly voice is apologetic: ‘God, I curse my brash self-assurance’ (in ‘Those Conversations We Didn’t Have’, p.8). And ‘…smart-arse daughter watching,/smug in her superiority How good am I?/An arrogant adolescent…’ (in ‘Drowning’ p.27). There is nothing self-serving about these poems. It seems to me that a feature of the collection is its scrupulous honesty about memories of being that daughter, that generosity supported by the collection of photographs against which the poetry plays out. In part the poetry represents a kind of retrospective apology for the moments of dismissiveness most of us will recognise, of which most of us have self-chastising memories. The things you would do differently if you had your time over again. It takes courage to make them the material of your writing. Just as often, the voice we encounter is one of deeply meaningful gratitude from a feminist daughter, one I might add who certainly cannot be said to lack a sense of humour—it would be a mistake to expect exclusively earnest poetry here: it can be ironic, lighthearted, funny— the emotional range is one of the achievements of the collection I think. I want to say that each poem is an iceberg. Each one floats on a deeper more complex story, the submerged more of life, a weight of emotional intensity, the interface between the personal and the political…Complex, wide-ranging, significant background material is contained, restrained, disciplined, shaped. This is poetry that trusts its reader to read in, into, beyond. I know icebergs are a cliché, but the thought persisted and the more acutely I felt this sense of the submerged depths of each poem, the more I was inclined to give in. However I need to add that it’s far too cold an analogy for this poetry, which is unquestionably warm. The collection is borne along on a sense of daughterly gratitude for diverse things, giving rise to a cumulative portrait of Eileen Dorothy Throssell, nee Jordan, the mother in question, a significant and notably quiet influence in her daughter’s life. That influence is honoured here through tropes as various and true-ringing as autograph books and ASIO transcripts, as the voice tunnels back, even to being the voice of a child made confused and afraid by prejudice-ridden elders, a reprehensible teacher, a venomous greengrocer…This is a strong questioning voice which it seems, even as a child, would not be cowed. On this historical note, sometimes the poetry is furious. Of course it is. The introduction gives us the reasons for this fury, reasons which those of us who know Karen’s work recognise in the persistent political vigour of her poetry, its resurfacing themes. Here it is again, carefully insisting on the demotic, colloquial, conversational voice, on domestic imagery, on the details of lived experience as the stuff of which poetry should be made. It happens that the lived experience in this case includes a legacy of dubious, dare I say shameful Australian political history, being brought to account here for its effects in the lives of a family. Most of all, however, this is a poet celebrating— without idealising — her mother. And one effect, the portrait behind the portrait, is of the daughter. It seems to me that the collection demonstrates that daughter taking her mother’s advice to the 14 year old self recalled in ‘The Autograph’, and in ‘Dorothy Jordan’s Tips for Better Homes and Gardens’: that is, ‘to do good for good is good to do’, and to do it for no other reason than that: With this poetry, there is no doubt that a poet has done good. It’s a great pleasure to congratulate Karen on the work she is offering us, and to be the one saying that Motherhood Statement is now launched. Consider it showered with champagne! Carmel Macdonald Grahame has been a teacher of literature and creative writing in secondary and tertiary institutions in her home state of Western Australia. She holds a PhD in Australian Women’s Literature. Her publications include short fiction, poetry and essays, in journals and anthologies here and in North America. Her novel, Personal Effects, was published in 2014 with University of Western Australia Press. She lives in Warrandyte, Vic. 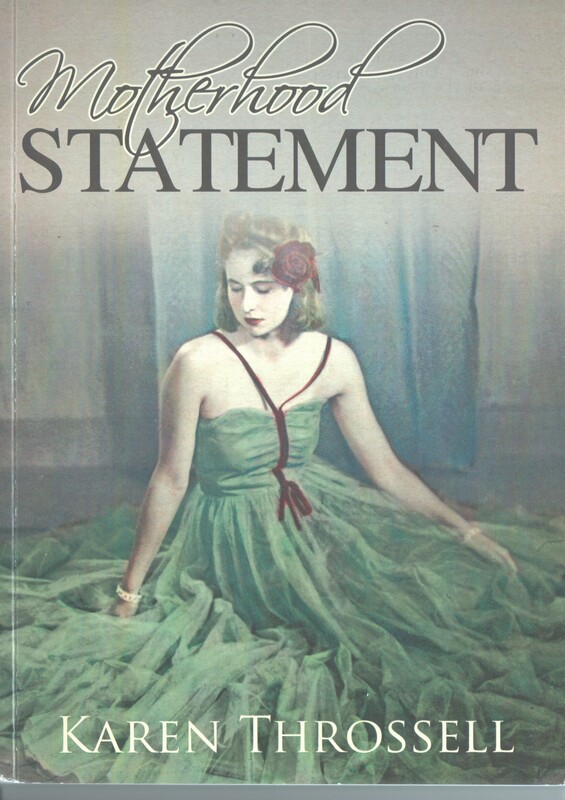 This entry was posted in Carmel Macdonald Grahame, Issue 14, Karen Throssell, Motherhood Statement and tagged Australian Literature, Australian poetry, Australian Womens' writing, Gwen Harwood, poetry by Mark Roberts. Bookmark the permalink.